St Andrews Citizen, 17 January 1931, 10. When the New Picture House opened in December 1930, St. Andrews became home to two competing sound cinemas situated on North Street. While the economic depression hovered over the country, the cinema managers invested in the latest and expensive Western Electric Sound Technology, and, in particular in the case of the Cinema House, which had opened in 1913, in extensive upgrades of the interior in order to prevent sound distortion. With the money spent, the sound conversion made it not only vital to sell and advertise the latest sound novelties. It was equally important to advertise the venue in order to prevail over the competition. 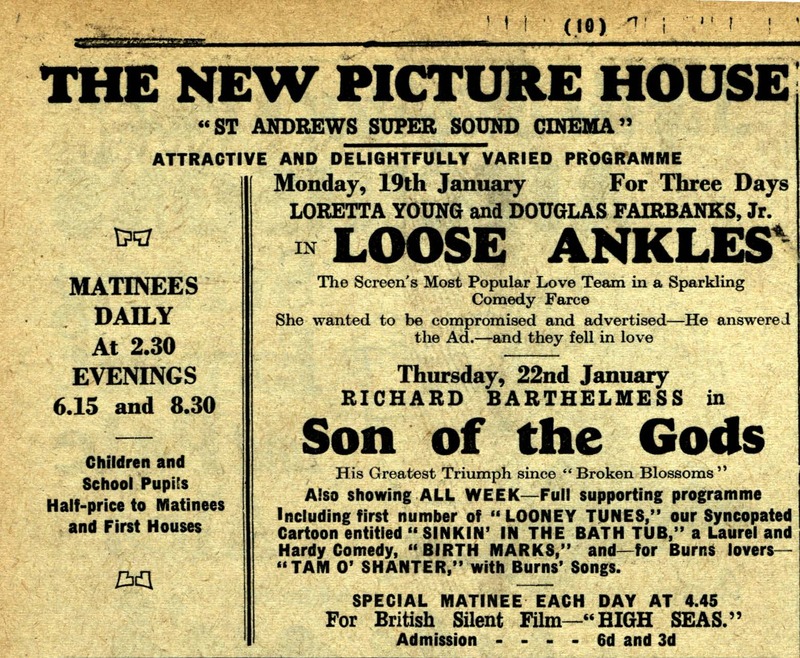 Upon its opening, the New Picture House, St Andrews’s Super Sound Cinema, offered the townspeople what the Cinema House seemed to lack: half-prices for children, daily matinees, and no booking charges. All three strategies naturally posed a threat to the long-existing Cinema House. One attempt to tackle this was the rebranding of the cinema. Not only had it been labelled as The House of Perfect Reproduction, but additionally as The Popular Centre of Amusement Seekers in St Andrews from January 1931 onwards. Over the course of the weeks, there had been several attempts on both sides to attract an audience. The Cinema House started to offer special matinees on Thursdays, Fridays, and Saturdays. It dropped its booking charges, and even offered entirely new features such as Book Your Favourite Seat now for Great Entertainment! In April 1931, the New Picture House responded by dropping its original label and by replacing it with the striking notion of Enjoy Ideal Comfort and Entertainment! There is a clear emphasis on the impressive interior of the cinema, while the entertainment is subordinate to this. The Cinema House never highlighted its interior in its adverts. The New Picture House, on the other hand, brought this new dimension into the marketing in an attempt to give patrons an additional reason for attending the picture house. This did not seem to be sufficient, however. 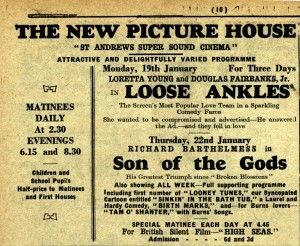 Only a month later, after the Cinema House increased its marketing effort with illustrated advertisements for films such as Whoopee! 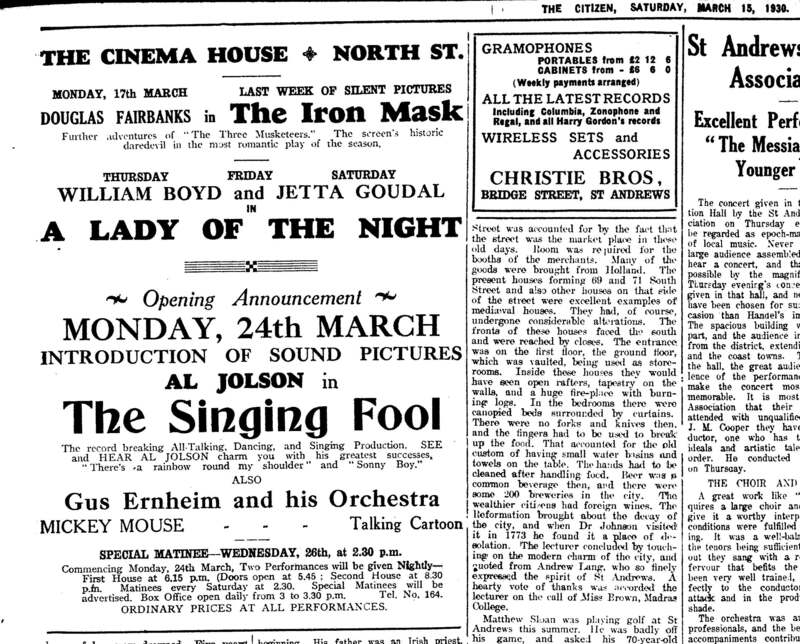 and with daily matinees for productions as big as All Quiet on the Western Front, the New Picture House once more altered its label, only slightly, but with an important meaning: on 30 May 1931, it presented itself with Enjoy Ideal Entertainment with Comfort! Adapting and subtly revising the April advertising phrase, this was a definite attack by the New Picture House on the grounds of quality. Strongly emphasising entertainment, the New Picture House pulled back from the attempt to impress patrons with its new interior. This telling change foreshadows the fight between two cinemas on the ground of entertainment, specifically over the acquisition of the best and latest sound pictures in an attempt to attract the townspeople. The Citizen (24 January 1931): 5. The Citizen (25 April 1931): 5. The Citizen (4 April 1931): 4. The Citizen (30 May 1931): 4.